Any of you watch "Dancing with the Stars"? Anyone? It's okay, you can admit you watch it here - this is a safe space. 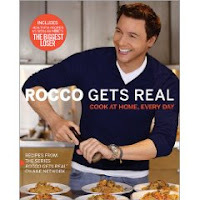 Well, I am CRUSHING on Rocco Dispirito*! I only knew him in name before; I had never opened any of his cookbooks, and I think he's on TV...but I don't know which show. But now I know who he is. He's an awful dancer, but he is just so damn sweet and charming...and apparently he can cook! So I'm going downstairs during my lunch break today to check out one or two of his cookbooks and see what he's about. If I like the cookbooks, I might buy one at my local bookstore. Which I suppose is why he agreed to be on the show in the first place. Announcement: Sarah Miller's new book! OT: My friend is fighting cancer with Merlot! It's a bird! It's a plane! It's your librarian!